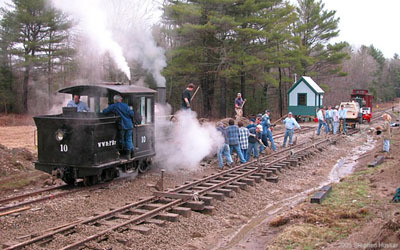 The Wiscassett Waterville & Farmington Railway Museum near Wiscassett, Maine, has struck on a formula for getting incredible amounts of work done by its volunteers. The annual spring and fall "Track Meets" bring a large contingent of volunteers together for a long weekend of projects that require a large amount of man (and woman) power. Usually these projects involve construction of track. As the railhead moves further and further north from the operating base at Sheepscot station, the logistics of supplying the construction gangs become more and more interesting. The deployment of motive power to efficiently transport workers and materials as well as visitors to the construction sites requires the use of all three of the museum&apos;s operational locomotives. Let&apos;s first take a look at the locomotives and then consider their use. WW&F Ry Museum Brookville #51, pictured at Alna Center. #51 is a Brookville gas-mechanical of 1.5 tons, really not much more than a ballasted motorcar. With its four-cylinder Continental engine and manual transmission, however, this little lokie can hold its own. WW&F Ry Museum Plymouth #52, pictured at Alna Center. #52 is a Plymouth industrial diesel locomotive built in the 1960s for Carpenter Steel of Reading, Pa. It weighs about 12 tons and is fitted with air brakes. #52 was the workhorse at the museum until the arrival of #10. It&apos;s slow but sure with #52. WW&F Ry Museum Vulcan #10 pictured at Alna Center Station during the 2005 Spring Equinox celebration. #10 is a Vulcan 0-4-4 rear tank steam locomotive of 1904 vintage. 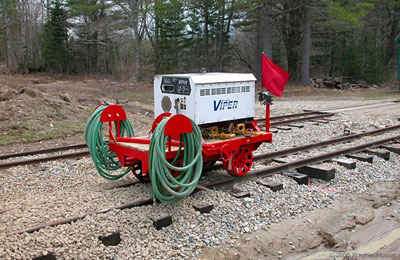 Built originally to 30-inch gauge for use in the Louisiana sugar cane fields, it was re-gauged to 24-inch gauge in the early 1960s and operated for several years at Pleasure Island, an amusement park in Massachusetts. It has been extensively overhauled and rebuilt by the WW&F shop over the past couple of years, receiving major boiler and mechanical work including new flues, stack and front-end arrangement, new bearings, crankpins and rods, and a beautiful new cab. 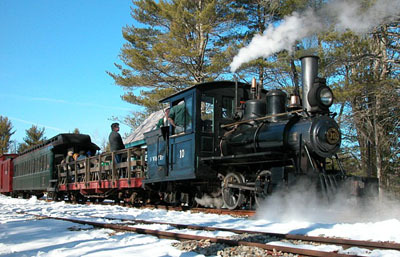 The railroad&apos;s main track extends about 1.6 miles from Sheepscot station, location of the shops and yard, to Alna Center. Alna Center was once a flagstop on the original WW&F and is located about a half-mile from the village of Alna Center. A disused town road known as West Averell Road extends from the village to the station, but it is not passable by anything other than 4-wheel drive vehicles. railhead using #51 and a flatcar, so that a stack of about 1,000 ties was available there. The same crew, using #52 and a flatcar, moved a truckload of rail that was delivered to Sheepscot to a suitable location near the railhead and stacked the rail for easy loading. When the actual weekend for the track construction project arrived, all three of the WW&F&apos;s locomotives were given specific assignments suited to their capabilities and the work flow. We&apos;ll deal with each one and the reasons for its assignment. #51 was assigned to the track construction crew. As outlined in a previous article, track laying at the WW&F has evolved to a pattern in which 150 ties are laid out beyond the railhead. #51 and a small flatcar are used to move ties to the end of rail and then volunteers carry the ties forward. When all the ties are in place, the flatcar is loaded with 10 lengths of rail and moved ahead. The rails are laid on the ties and temporarily held in gauge by "insta-track." The track-laying moves forward, 30 feet at a time, until 300 feet of new rail is down, and then the volunteers spike everything to gauge. #51 is light enough and flexible enough to power the flatcar over the unspiked track. 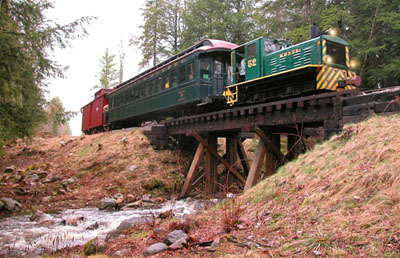 During the April weekend in 2005, the trackwork included not just construction of new main line, but also featured completion of work started last fall on a passing siding at Alna Center, and #10 was employed in providing ballast for that work. 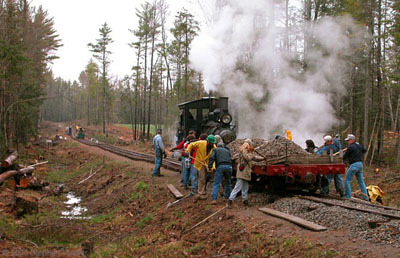 #10 was used to power the ballast train because it can traverse the main line more quickly than #52, and for most of Friday, it made regular runs from the ballast pile at Sheepscot to Alna Center, where yet more volunteers unloaded the ballast onto the siding. As soon as the car was empty, it was hustled back to Sheepscot for loading while the crew jacked the track and surfaced, using pneumatic tampers. Air for the tamping was provided by an air-compressor on a purpose-built car designed and built by volunteer in his home shop. 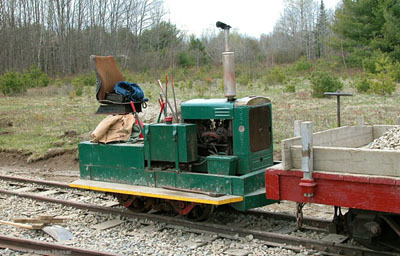 Compressor car built by museum member Gary Recave. #52 takes passengers north across Humason Brook . 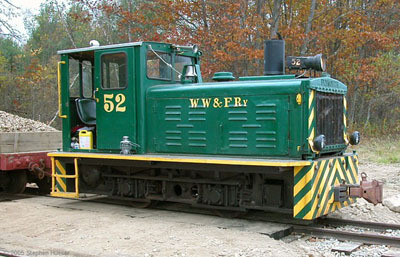 Meanwhile, #52 was used to power a "regular" train to convey arriving volunteers and visitors between Sheepscot and the work site. The south end of the Alna Center passing siding was serviceable, and on several occasions, the steam-powered work train and the diesel-hauled passenger train passed one another at the siding. Trains were dispatched from Sheepscot and Alna Center on telephone orders. #10 unloading north of Alna Center. As the weekend progressed, the railhead moved north from Alna Center and the materials piles, requiring longer runs for ties and rail. Then, too, the work on the siding was completed, and #10 began to deliver ballast to the main line track north of Alna Center. Ballasting new track north of Alna Center. By the conclusion of the work weekend, track extended over 1,200 feet beyond Alna Center and the passing siding was put into service. The volunteers finished the ballasting and surfacing of the passing siding, completed the switch at the north end of siding and tied it to the siding, and laid 810 feet of new track. Over 60 volunteers signed in over the weekend, and all three locomotives performed flawlessly. The work completed by the volunteers would have been much more difficult without all three locomotives.